How can I set up a VirtualHost on my local developer environment? Ideally I would also like to be able to access my site from a simply URL, such as www.joomla.loc rather than having to constantly use the localhost URL. 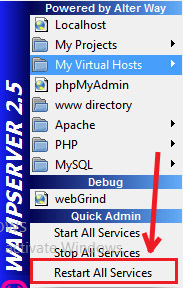 In this I will explain how to set this up for Wampserver 2.5 with Apache 2.4+. Once you have downloaded, installed and started Wampserver, go to the following directory on your computer and created a new folder called "joomla"
Within your newly created folder, extract the Joomla zip file. Note that I have 2 instances, 1 with www and 1 without. If you are unable to save and are thrown a permissions error, try running your text editor on Administrator Mode, by right clicking the .exe and going to "Run as Administrator". The above code is only for Apache 2.4+ and will NOT work for Apache 2.2. Now type in your browser's address bar: http://joomla and hit Enter! You must be a super user in order to edit the above files. ServerName is the name you will type into your address bar to access your website. DocumentRoot is where your website is located. You should now be able to go to http://joomla and acces your website! Hopefully I haven't left anything out! Not the answer you're looking for? Browse other questions tagged localhost virtualhost or ask your own question.